It doesn’t get much easier than this. 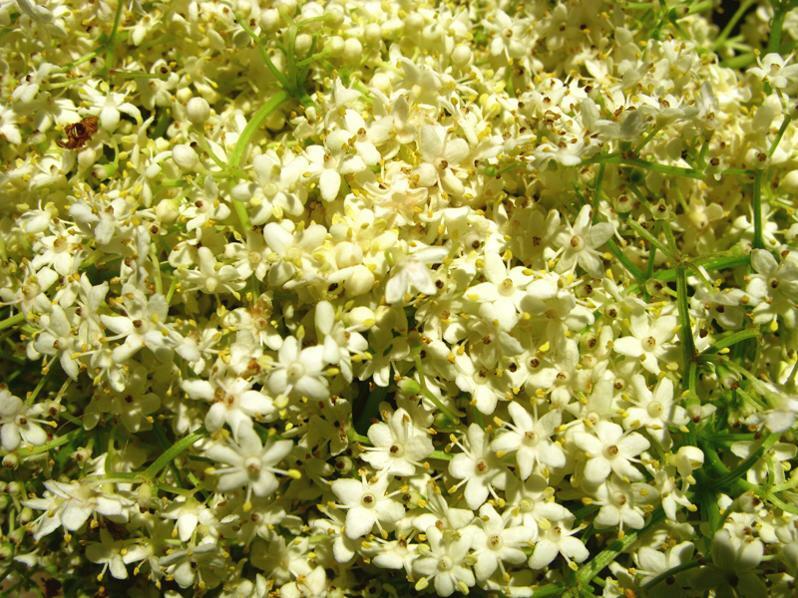 I love the taste of elderflower, and the health benefits are not to be sneezed at! Pour boiling water over the elderflowers, sugar, and lemon juice. Stir, then leave to steep for 12 - 24 hours. Strain out the flowers, add the liquid to the fermenting vessel, stir in the yeast and seal. A primed ginger bug may also be used instead of yeast. Ready to bottle in 4 – 7 days (750 ml bottles primed with 1 tsp of raw sugar), ready to drink 7 – 10 days after that. Elder stems contain small amounts of cyanide, so it's best to always seperate elderflowers and elderberries from their stems before use. You won't get them all, but a little bit will do you no harm. Elderflowers contain bioflavonoids (especially flavones and flavonols) known for their antioxidant. anti-cancer, anti-inflammatory and antibacterial properties. Elderflower extract has been shown to be effective against MRSA (golden staph), and the flavonols quercetin and isoquercitrin and elderflower’s innate anthocyanins also have antiviral properties. Elderflower contains chlorogenic acids, which can ease allergies, regulate blood glucose levels and have a laxative effect on the body. The triterpenoids β-amyrin, erythrodiol, and oleanolic acid in elderflower offer analgesic, anti-inflammatory, and anti-cancer properties. Traditionally, elderflower is used to relieve colds and flu, sinus and respiratory problems, allergies, hyperglycaemia, inflammation, and infection.